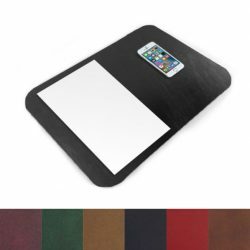 Our glazed leather desk pads offer a captivating sheen when hit by the light, unique from all other leather materials. Hand-wrapped in full grain gloss leather, each glazed leather desk pad features a distinct pattern, showing off its natural leather. 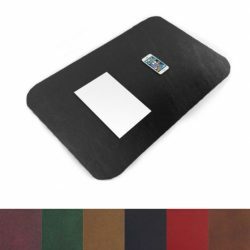 The faux-suede backing provides surface protection while also resisting stains and easy maintenance. 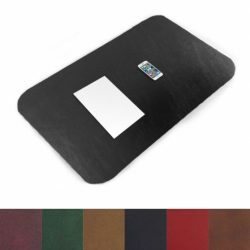 Our glazed leather desk pads are available in seven deep and rich colors, sure to add an air of sophistication to your desk and office. 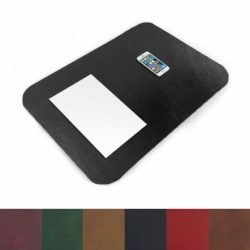 Choose from four of our most popular sizes, ranging from 12×18” to 24×38” or have a completely custom glazed leather desk pad created in the size of your choosing. Logo embossing is also available.